Through clay, I express my connection to the natural world. Each work speaks to the process of change, whether through the appearance of age or the spontaneity of gesture. Lured by the color and texture, ancient in feeling, I often express these qualities through the use of fragmentation. Small surface elements draw the viewer into a larger context, where hundreds of parts interact to form a whole. Organized as a grid. 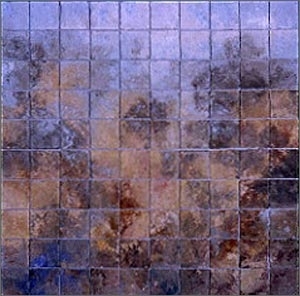 Torn and textured squares compose a rhythmic pattern, which balances the energy of the organic.